This is a Compiz plugin to enable real 3d screen/window in Ubuntu,and you just need a wear of 2 color glasses to turn the ordinary monitor into a real 3D one. Now,go to System->Preferences->CompizConfig Setting Manager.Search “anaglyph” (without the quotes),check the checkbox,then click to go into its configuration page and set the hotkeys. Now,you can enable the 3D screen and window with the hotkeys and enjoy 3D movies in your computer! 24 users responded in " Install Compiz Anaglyph Plugin-real 3D screen/window in Ubuntu "
¿Sure this .deb is safe!? Open the deb file in File-Roller and open de “Data” file. Go to the folder .compiz and copy the 2 folders in your home in the .compiz folder. Works here. (I think Florian was the person that create the deb package from his home dir). I am using Ubuntu 10.04 LTS. Unfortunately with the installation of this package the “CompizConfig Setting Manager” does not appear in the System->Preferences menu. I have tried the method described by Danilo as above however this appears to have changed nothing, any luck from other 10.04 users and/or known fixes? This “florian” home folder is key to get the compiz anaglyph settings. Get there, and dig in folder “.compiz” (it’s hidden, try ctrl-h in nautilus), and copy anything it contains in your compiz folder, I mean “~/.compiz”. It works for me. Please help! It’s working when I turn on with F12 but my opened windows and programs don’t have this effect like this picture -> http://th03.deviantart.net/fs44/PRE/i/2009/067/8/0/Anaglyph_by_11e097.png..only my wallpaper and my gnome-panel have it! I installed this plugin and it seems to work, but I tried two different types of Glasses the RealD 3D glasses from the movies and I also tried the Anaglyphic 3D paper glasses and it does not work either, so can you please point me to the exact glasses one would need to use this plugin. I went to this website http://www.the3dmarket.com/Plastic/anaglyphic-aviation.asp but I don’t know which one to buy. 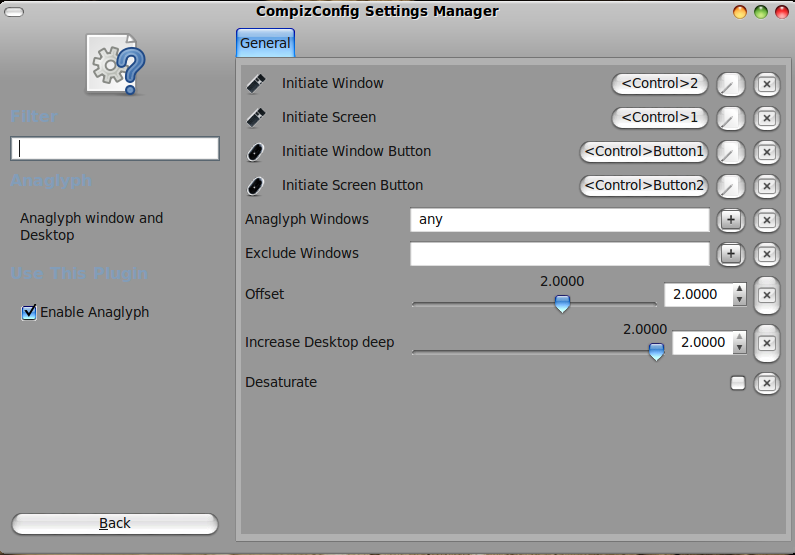 I tried this, but CompizConfig Setting Manager did not notice a change. I tried opening the .deb using Ubuntu Software Center, and it told me it was already installed. (You can install it from there instead of terminal if you prefer, BTW.) Do I need to restart or something? I got it installed, and followed the above directions (copy files to ~/.comipiz), but every time I enable the plug-in, it is automatically un-checked, even if I disable the automatic sorting. Therefore, I cannot enable this! I have Red-Blue style 3D glasses ready, but I cannot get either of my computers to run this. Hi, the installation was successful…it looks very nice. I have just a question…what is the difference between window and screen in the configuration page?. i have the same problem too! Can somebody tell us what is going on here? Can someone please tell us the solution of our problem? A window is an application. (firefox, blender, OpenOffice.org) More accurately, it is a single instance of that application. The toggle button for windows should make an individual window 3d, unless the desktop is visible, in which case the desktop will be in 3d. A screen is everything on your monitor. A single window should take less processing power than a whole screen, but some of us would like to see compiz’s desktop cube effect in 3d. You would need to use the red/blue type 3d glasses. If I am correct the RealD 3D glasses are polarised, so each lens gets full color, but most monitors don’t support this. You could get a there is another expensive method of 3D that involves glasses that hide the monitor from the eye every other frame, which also requires a special monitor, so the red/blue method is the best option for everyone. You can go to a store and get a pair of glasses where one lens is red and the other is blue or you can print a pair of glasses on transparency paper. Sounds like you toggled the window button with the desktop selected. Try the toggle screen button. I have the very same problem. I see the anaglyph icon, but if I check it after one second or so it automatically uncheck. compiz (core) – Error: Plugin ‘core’ has ABI version ‘20091102’, expected ABI version ‘20090619’. It seems a problem of compatibility, my compiz “core” seems too new for the one expected by the plugin. Do you have the same message? by the way I have the same error and I am using Ubuntu 10.10. I can check anaglyph in “CompizConfig Setting Manager” but it just has no effect. Compiz of course is enabled in window-settings.